As a guest at the Bay View Resort this fall, you are going to save on some of the best attractions, show tickets and more while staying here between September 4 – November 30. We want to thank you for choosing Bay View for your Myrtle Beach vacation. Not only do we offer you direct access to the blue Atlantic ocean, and direct access to the Myrtle Beach Boardwalk, we wanted to give you the best savings and deals to allow your vacation to be a little less stressful and a lot more fun. 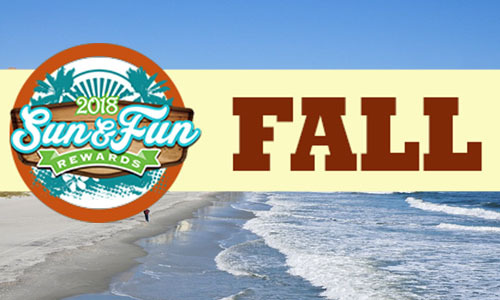 This fall, the Sun and Fun Rewards program gives Bay View Resort guests a package during check-in that includes free tickets, discounted admissions and other perks at some of the most popular attractions in the Myrtle Beach area. WonderWorks Myrtle Beach: This Broadway at the Beach “amusement park for the mind” is impossible to miss in its upside-down building — and the Sun & Fun Rewards program allows one adult guest to explore its 50,000-square-foot array of family-friendly “edu-tainment” for free. That gives you a savings of $28.99 over the regular admission price! Hollywood Wax Museum: Receive a discounted adult All-Access Pass to Hollywood Wax Museum — where, at $24.95, you’ll realize a savings of more than $5 on the regular price while rubbing elbows with the likenesses of music and movie stars, NASCAR champs, royalty, and more. Unlimited DVD Rentals: Right here on property in the Bay View lobby, you have access to hundreds of your favorite titles during your stay. Your in-room entertainment of unlimited DVD rentals that you can pickup at the lobby kiosk and enjoy in the comfort of your room. As you see you can enjoy amazing deals and savings this fall while staying at the Bay View Resort. Now, I bet you are excited for your Myrtle Beach vacation!